From Fitbits to GPS trackers, wearables promise to help us understand and improve ourselves in quantified ways. We count our steps, track our location, and even monitor our brain waves as we strive to achieve better fitness, clearer direction, or a more focused mind. But why do we rely on wearables to learn about ourselves? In Instrumental Intimacy, Melissa M. Littlefield questions our desire for mechanistic guidance by examining brain-based EEG wearables that promise to improve sleep, relationships, self-knowledge, and learning. Littlefield focuses specifically on EEGs' transition out of the laboratory and into the hands of consumers. While other brain-imaging technologies (such as MRI, PET, and MEG) are used only in specialized laboratories, human electroencephalography (a.k.a. EEG) is embedded in portable, user-friendly devices. These direct-to-consumer wearables visualize brain activity as accessible data, and many offer the promise of self-optimization. Littlefield's illuminating book brings the histories of EEG to bear on the contemporary development of EEG wearables via case studies of EEG-based sleep aids, bio-mapping instruments, fashionable surveillance tools, and athletic training devices. The author argues that, over the past century, applied uses of EEG helped to create new states of mind to be monitored and manipulated, as well as discourses about the existence of brain waves and their viability as a tool for brain optimization. 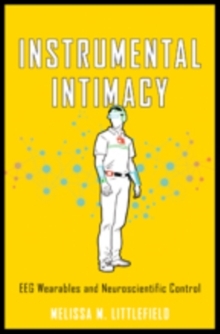 By contextualizing and analyzing EEG wearables, Instrumental Intimacy provides a crucial intervention in an emergent consumer market and in the scholarly fields of STS, critical neuroscience, and the history of technology.